After placing your order, you will be shipped a sample collection kit. This kit will include detailed instructions on how to painlessly collect a blood sample using just your fingertip. See also the instructional video below. Shipping your sample to us is easy - just use the pre-paid label found in your blood collection kit. After receiving your sample, it will be processed and analyzed for biomarker levels. A few weeks after receiving your sample, when biomarker testing is complete, your individualized wellness report will be prepared and uploaded to the PanoHealth secure web portal and an email will be sent to you indicating it is available for viewing. PanoHealth’s testing facility is compliant in Good Laboratory Practice (GLP) and ISO-13485 certified. The Quantibody® technology used is a proprietary technology which allows for the rapid and accurate analysis of biomarkers present in the blood. It works by using antibodies that tightly bind to the biomarkers and allow for their detection. Quantibody® technology has now been developed to simultaneously test over 1,000 biomarkers, yielding valuable information pertaining to many different physiological or disease states. Quantibody® employs a matched pair of antibodies for protein biomarker detection. A panel of capture antibodies is printed on a glass slide. After a blocking step, samples are incubated on the arrays. Proteins specific to the capture antibodies are bound to the slide, and the nonspecific proteins are then washed off. 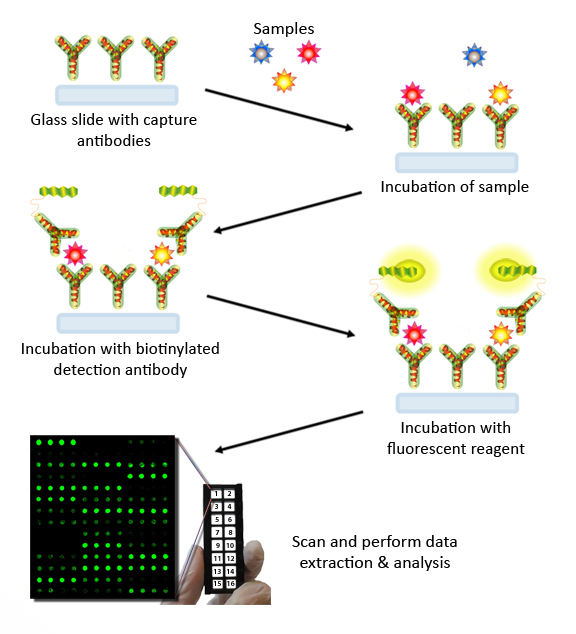 The arrays are incubated with a cocktail of biotinylated detection antibodies, followed by a streptavidin-conjugated fluorescence marker. This creates green-fluorescent signals which are visualized using a fluorescence laser scanner. The intensity of the fluorescent signals indicates the amount of the protein biomarkers on the glass slide array. This process of measuring specific amounts of protein molecules is called Quantitative Proteomics. © 2016 PanoHealth, LLC. All rights reserved.